Be sure check out all of our available Back Plates and Ceiling Canopies. Click Here! Sadly this glass shade recently became unavailable, but many different glass shades have both 4 inch and 2 inch versions. 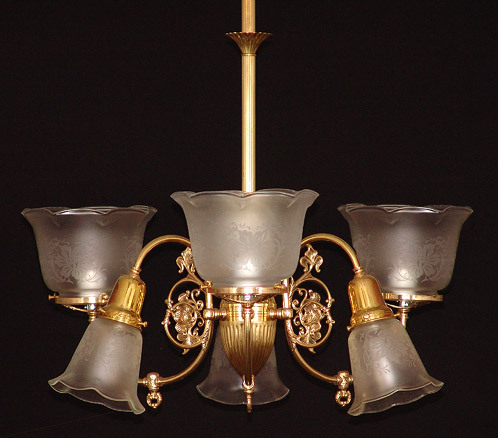 As long as they are alternated, they will look equally spectacular on this Victorian reproduction gas chandelier. Complete with reeded solid brass tubing and Faberge shaped center body, this is an exquisite centerpiece for any dining room, entryway, foyer or even your master bedroom. See a design variation on the next fixture. Our specialty is creating matching fixtures. Wall sconces anyone? Arms can be designed in reverse if you like with the larger shades facing down, or even with all arms facing one direction. It's up to you!